…back to the Bourbons – American whiskey tasting no 6. 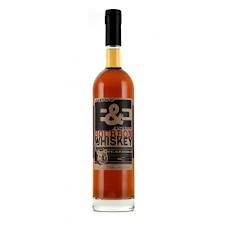 Breaking & Entering Bourbon Whiskey, 86 proof (43%). The St. George distillery started as an artisanal producer of eau de vie in 1982, now in many ways seen as pioneers of Americas craft distillery movement. Through the years the company has diversified into gin, absinthe, rum, fruit brandies, liquers and finally whiskey. There´s a prestigious single malt that I haven´t yet tried, and now a blended Bourbon brought home to California from Kentucky. After selecting almost 400 barrels of choice Kentucky whiskey from different distilleries, careful tasting and blending using about 80 of them with ages 5 – 7 years resulted in Breaking & Entering Bourbon. Distilled in Kentucky but born at the distillery in California. So, what do we get? The colour is a pleasant light amber. The nose has vanilla and banana notes and some oak at the end. In a tasting glass it´s surprisingly dry for a Bourbon and you don´t get much corn or caramel notes. Initially there´s a notable alcohol burn followed by a pretty short finish of rye spiciness. In a tumbler with ice the nose shows an additional rye white pepper tone, while the palate becomes quite bland. Sold in a pretty unremarkable bottle, high and slim and with a batch number that seems to be printed on the label slightly askew as to look stamped on. Although almost universally lauded, I´m not that crazy about this whiskey and I don´t think there´s going to be a return match. I´m much more interested in their single malt, which will have to be a later project. 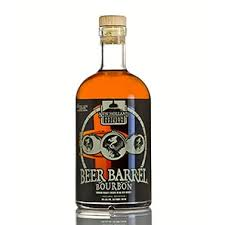 Beer Barrel Bourbon, 80 proof (40%). Started as a microbrewery 1996 in Holland, Michigan, the company produces an impressive line of craft beers (none of which I believe is available in Sweden). Distillation of gin, rum and whiskey started in 2005. Already being well versed in beer, the idea of aging whiskey in beer barrels wasn´t that far off. One of their most hailed beers, Dragon´s Milk, is an imperial stout finished by a period of aging in second use Heaven Hill Bourbon barrels. After sourcing Bourbon from Lawrenceburg Distillers Indiana that´s been aged in new oak casks for some years, the guys at New Holland puts it in used Dragon´s Milk barrels for three months as a finishing touch. The colour is deep gold, with an interesting nose with some oak, hints of caramel and definite notes of beer and hops. In a tasting glass it´s light and rounded, fairly dry with some oak and a slight burn to the finish which has a bitterness I believe to come from the hops. In a tumbler with ice nothing much changes, except for a dilution of the taste. Offered in a short, wide bottle with a frankly quite ugly label, narrowly saved by the quality wood/cork stopper. Nothing stellar, but a fun idea and I´m definitely going to try to get hold of some more of their products. High West American Prairie Reserve, 92 proof (46%). Started in 2007, the High West Distillery is not only Utah´s first legal distillery since Prohibition, but also the world´s only ski-in distillery and gastro saloon. 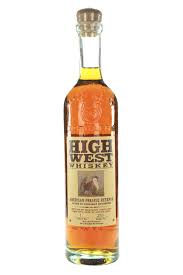 As is the case for many of the new craft distilleries, High West hasn´t yet released any of its own distillates, and keeps business going by sourcing whiskey from others and blending them under their name. The practice can be discussed, of course, but let us be positive for the time being. According to the company´s website this is a blend of two straight bourbons. The first one 6 years old and made from a mash bill of 75% corn, 20 % rye and 5% barley malt by Lawrenceburg Distillers Indiana. The second 10 years old and made of 60% corn, 35% rye and 5% barley malt by Four Roses. None of the whiskeys used has been chill-filtered or carbon-treated. Nothing is said about the proportions between the two, but I would dare a guess that it´s heavier on the 6 year than on the 10 year old. Amber colour with a nose characterized by caramel sweetness, oak and hints of cinnamon. Neat in a tasting glass we get a fairly light mouthfeel with oak, cinnamon and some caramel. The finish is dry and spicy. In a tumbler with ice the nose sweetens while keeping the oak, and the palate paradoxically increases the dryness and spicy oak. The bottle is quite stylish, high and slim with embossed glass and a wood/cork stopper. The seemingly handwritten batch and bottle numbers adds to the feeling of drinking an exclusive beverage. I kind of like this one, but can´t help wondering what their own whiskey is going to be like when it´s finally released. We´ll just have to wait and see. Another thing, the distillery promises to donate 10% of its profits to the American Praire Foundation, aiding in the creation of the huge American Praire wildlife reserve. Michter´s Small Batch Bourbon, 91,4 proof (45,7%). Michter´s is by now an old acquaintance and I´ve already written about their straight rye. Learning more about this producer things starts to look a bit sketchy. There doesn´t seem to be any other connection between the original and historic Pennsylvania distillery apart from the name. Current Michter´s is distilled at an undisclosed location and bottled by Kentucky Bourbon Distillers. The company is however setting up a pair of distilleries in Kentucky, making them quite similar to other producers that are bottling whiskey made by others while waiting for their own. A very well written and informative post on this can be read here. I haven´t been able to find that much information about the production of this whiskey, other than that it´s made from American corn, distilled in small batches and undergoing an undisclosed filtration process. It shows a sparkling deep amber colour. A complex nose with corn sweetness, caramel, vanilla, fruit and some rye spiciness in the finish. Neat in a tasting glass you get a pretty full and smooth taste with some sweetness and vanilla notes, plenty of oak and a lingering spicy finish. In a tumbler with ice the sweetness takes over, increasing the smoothness but shortening the finish. I actually like this, and the offerings from Michter´s that I´ve tried so far are amongst my favourite American whiskeys, regardless of the hugely overblown and partially inaccurate marketing hype. This entry was posted in Food & drinks and tagged Beer Barrel Bourboun, Breaking & Entering Bourbon, High West Distillery, High West Praire Reserve, Michter´s, Michter´s Small Batch Bourbon, New Holland Brewing, St. George spirits on August 28, 2014 by danolofohman.